Hi Friends. Welcome to my site! I’m Hannah and I created Handmade Weekly to share my DIY projects. I live in Cincinnati Ohio with my husband/high school sweetheart and our Great Pyrenees. I’m a civil engineer by trade, product manager by day and DIY enthusiast by night and weekend. I’ve always had a passion for creating things and I took that to a new level a few years back when we purchased our current home. I went from living in small homes or condos to a three bedroom, 2000+ square foot house and I needed a lot more décor and furniture than I had anticipated. I tend to be rather frugal and furniture can be CRAZY expensive so I did the only thing that made sense to me, invest in some tools and build my own! This turned out to be one of the best decisions that I’ve ever made. Not only did I find out that I loved woodworking but I saved thousands of dollars by creating my own furniture and décor. There is something amazing about creating something beautiful from scratch. 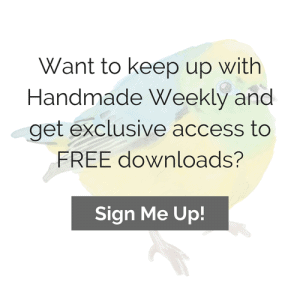 Handmade Weekly is a site where I share all of my creations along with tutorials. It is still in its infancy but as the weeks progress, the content will expand to include DIY furniture tutorials, DIY home décor tutorials, recipes, free downloads and more.